This is a real SS X55 code matching # 350 engine and 350 turbo transmission, interior is original, bucket seats console with gauges , tachometer in dash, ac, power disc brakes 12 bolt rear end,car is rust free, has been repainted, only part replaced was trunk pan , have photos of all work, car also has power top. 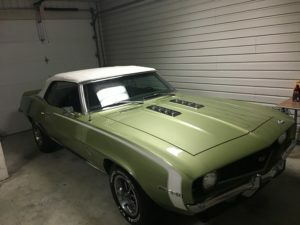 Very rare and extremely nice example of a 1969 Chevrolet Camaro SS Convertible … This Camaro is in exceptionally nice condition, This Camaro was professionally repainted in the Original Frost Green exterior with Black vinyl interior and features a power top and the highly desireable SS X55 option packages. The engine is matching numbers SS Camaro, 350 V8 motor from GM. *15,866 V8 Convertibles were built in 1969. The 1969 Camaro carried over the previous year’s drivetrain and major mechanical components, but all-new sheetmetal, except the hood and trunk lid, gave the car a substantially sportier look. The grille was redesigned with a heavy “V” cant and deeply inset headlights. New door skins, rear quarter panels, and rear valance panel also gave the car a much lower, wider, more aggressive look. This styling would serve for the 1969 model year only. Collectors often debate the merits of smooth, rounded lines of 1967 and 1968 model versus the heavily creased and sportier looks of the 1969. To increase competitiveness in the SCCA Trans-Am racing series, optional four wheel disc brakes with four-piston calipers were made available during the year, under RPO JL8, for US $500.30. This system used components from the Corvette and made for a major improvement (except when sport striping or Z28 Special Performance Package is specified), simulated rear fender louvers, front and rear wheel opening moldings, black body sill, RS emblems on grille, steering wheel and rear panel, Rally Sport front fender nameplates, bright accented taillights, back-up lights below rear bumper; also includes bright roof drip moldings on Sport Coupe. $131.65. This option could be added to any other option (i.e., SS or Z/28), making the model an RS/SS or a RS/Z28. 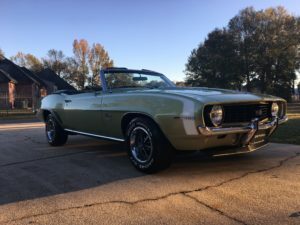 The Z28 option was still available with the 302 cid small block. It was backed by Muncie four-speed with a new-for-69 standard Hurst shifter and connected to a 12-bolt rear axle with standard 3.73 gears. The 302 featured 11:1 compression, forged pistons, forged steel crankshaft and connecting rods, solid lifter camshaft, and Holley carburetion on a dual-plane intake manifold. A dual four-barrel crossram intake manifold was available as a dealer-installed option. The 1969 model year was exceptionally long, extending into November 1969, due to manufacturing problem that delayed the introduction of the second generation model planned for 1970. It is a popular myth late-’69 Camaros were sold as 1970 models (due to GM publicity pictures of the ’69 Camaro labeled as a 1970), but they were all assigned 1969 VIN codes.